Wherefore, because thou hast been faithful thy seed shall be blessed with his seed, that they dwell in prosperity long upon the face of this land; and nothing, save it shall be iniquity among them, shall harm or disturb their prosperity upon the face of this land forever. As one who has been keeping up to date on the treasonous Security and Prosperity Partnership, I find these two verses quite interesting. Lehi, a prophet, clearly states what is necessary for security and prosperity: faithfulness, absence of iniquity, and obedience to the commandments. Perhaps it is not coincidental that this “non-binding” partnership between the United States, Canada, and Mexico carries the same name, yet does nothing to promote, encourage, nor enforce the few things that will actually lead to security and prosperity. Instead, borders are erased, wealth is distributed, and Constitutional mandates ignored in an attempt to fabricate such success. True security and prosperity will only come through a life of righteous living—not a government program to destroy sovereignty, redistribute wealth, and homogenize laws of different nations. 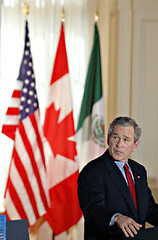 The title Security and Prosperity Partnership of the North American Union is only a deception. Newspeak. It really means security and prosperity for the small rich, ruling and elite class of those in power (at the expense of the everyday American). I’m against the SPP also. Do I read you correctly here though in saying that you see it as a measure that will redistribute wealth? The only redistribution of wealth involved here seems to be robbing the poor to give to the wealthy. There’s no socialistic type downward redistribution evident in the least in the Wikilink you’ve provided. The homogenization of laws is a tactic the Multinational corporations have been after for a long time. They really tried to sneak one over on us with the M.A.I. or Mulitlateral Agreement on Investment movement that was mercifully shot down in its infancy by wise men in a grassroots manner in the 90s. Clinton, the schmuck, was very supportive of the M.A.I. It’s classic secret combination type of stuff. A corporation could sue a government for even contemplating a law that would hurt its profitability, such as workplace safety laws, minimum wage laws, environmental laws etc. NAFTA, CAFTA and now this SPP are off-shoots of the M.A.I. and continuations of this powerful secret combination which I personally consider to be the great secret combination of the latter days that will seek to destroy the freedom of all nations, if not something very close to it. Do I read you correctly here though in saying that you see it as a measure that will redistribute wealth? The only redistribution of wealth involved here seems to be robbing the poor to give to the wealthy. SPP will siphon large amounts of dollars to supply and bolster the weaker economies, primarily in Mexico. So in that sense, yes, it is redistribution of wealth. The American middle class will be funding the poor in the other two countries as we are homogenized into a North American Union. You are right, however, in that the economic elite will also stand to gain. The same has occurred with corporate corruption, the inflation tax, and other fiscal policies that wipe out the middle class, hurt the lower class, and make the rich even richer. It’ll be interesting to see a trade agreement that actually does help the poor in a 3rd world country. That’s never really happened to the best of my knowledge. With NAFTA the minimum wage in Mexico plummetted and the middle class shrunk massively. We saw a concurrent increase in illegal immigrants from Mexico as their livelihoods in the homeland disappeared with the appearance of cheap American goods in their market. Trade agreements are always by the corporations, of the corporations and for the corporations almost exclusively. Occasional crumbs trickle down to the little guy, but the rich run off with the bakery inevitably. It’ll be interesting to see a trade agreement that actually does help the poor in a 3rd world country. Trade agreements are always by the corporations, of the corporations and for the corporations almost exclusively. Yeah, that’s what the World Bank is all about, too. Under the guise of economic aid, the lower class is pushed even lower under burdensome laws, regulations, and taxes.